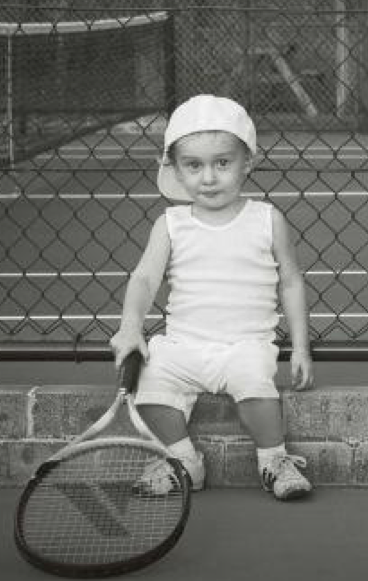 Two Sons, Three Parents, Four Friends and a Tennis Coach! The winner may take all … but is there ever a true winner? whilst juggling school education on the one hand, with training as performance tennis players on the other. But the last call and deciding point is a “SPIN”? … Who will win? between the hero Nick, and his rival Benjamin. the result of which is unknown, by anybody, until the outcome of match point. The Cast have rehearsed two different final scenes, and are prepared for either result, each performance. mini tennis leagues and tournaments from local school level up to the National mini tennis competition. Imagine a badminton court with the net lowered, so that the bottom of the net touches the ground. Imagine a small duplicate tennis racquet. at the correct height, and still responds to spin. Also brightly coloured and spectator-friendly. In other words, imagine the game of tennis in miniature, proportionally reduced, but otherwise as realistic as the full-scale game, employing all the shots & tactics of tennis so that a match between Andy Murray and Roger Federer would still be as spectacular and exciting as if it were played on Centre Court at Wimbledon. PUT SIMPLY …… THE COURT SIZE CAN BE ADAPTED TO SUIT THE SIZE OF THE STAGE! TIEBREAK the musical is intended at 2 hours’ length with a 20-minute interval. The set is a green tennis court laid flat on the stage. of the court, brought in at times of dramatic conflict. For the finale itself, a real net is erected and a real game played. Up to that point, the flat-floor rectangular set provides the appropriate arena for the dramatic movement that arises from the interactions of characters and situations within the context of the game of tennis. The sensation of the passage of time is created on the clock and scoreboard on the audience-free side. but moveable as and when necessary! To portray different times and places, the sets, scenery & backdrops would change around the court area!